Nature Boy is the top song in America for two months, selling over a million copies and being named by disc jockeys at the time as the record of the year. This was the second chart topper for Nat “King” Cole, the first coming in winter 1947 with “(I Love You) For Sentimental Reasons”. That record had made him just the third black artist, and first solo singer among them, to reach the top of the pop listings, the others being The Mills Brothers and The Ink Spots (the latter once with Ella Fitzgerald guesting). The former jazz pianist whose King Cole Trio was among the hippest aggregations in music throughout the early 1940’s had increasingly switched to a mellow pop crooning style over the years which gave him almost unprecedented access for a black artist to the mainstream pop realm. The popularity of Nature Boy allowed him to leave the Trio behind and established him as one of America’s most iconic singers, regardless of race. Cole’s languid baritone would now be backed by lush strings which took the edge off what had been very sharp quirky musical accompaniment with his own trio, as gradually his stylistic origins were almost done away with completely. But his achievements as a black man crooning dreamy love songs that were being snatched up by the white masses was all the more remarkable for that era where segregation was still legal in most walks of life and the doors he opened with that success can’t be understated. Though notably it was with a style designed for mass consumption rather than the more adventurish work he cut his teeth on, not to mention the more uncompromising approaches that were currently making headway in rock ‘n’ roll. 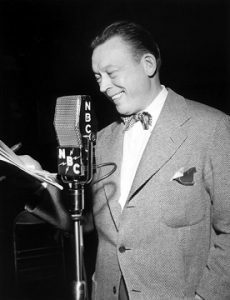 The Fred Allen Show was the #1 radio program on the air for the 1947-48 season which came to a close in May. The erudite dry witted comedian was one of the most popular stars of radio’s golden age for a decade (1939-1949). His long-running feud with rival radio star Jack Benny was radio’s longest ongoing joke, as the two comedians ridiculed each other mercilessly on their respective shows for years, leading many to believe they were mortal enemies though in fact they were friends in real life. Allen was also known for frequent battles with the networks over content deemed objectionable as his cerebral jabs frequently flew over the censors heads and he’d constantly be forced to explain, defend and then often edit scripts for their approval. At the height of his popularity in the mid-1940’s he took a year off due to hypertension, a condition which would kill him a decade later after he made an uneasy transition to television, a medium he never felt comfortable in, famously saying “Television is a vehicle that permits people who haven’t anything to do to watch people who can’t do anything”. Yet his influence on future generations of TV stars was immense with Rowan & Martin’s Laugh In (the most popular show on TV at the end of the 1960’s) and Johnny Carson’s Tonight Show, both adapting Allen’s routines and ideas for their own. Even cartoons shamelessly took from Allen, as the blowhard rooster Foghorn Leghorn was a direct imitation of the fictitious loudmouthed southern Senator Claghorn on Allen’s radio show. Allen’s distinct nasal voice and New England accent, highly topical humor and a distinctive writing style in which he basically acted as the set-up man for the jokes he gave to his many eccentric supporting characters all helped to set him apart from his competitors and as radio’s hold on the American public began to wind down with the dawn of the TV age, Allen remained its intellectual comedic conscious until he retired from the medium that had made him a star after the 1949 season, just a year after his ratings peak. In many ways his show reflected the last look at the small town community ideals that was pushed aside by post-war modernity. Norman Mailer’s The Naked And the Dead is published, among the first, and considered one of the best, first-hand accounts of World War Two as seen through the eyes of soldiers, though it’s entirely fictional. An egotistical and ambitious twenty-five year old who’d served in the Pacific, Norman Mailer deliberately set out to write the Greatest War Novel Ever and its enormous success, spending over a year on the best seller list, and the praise that accompanied it turned its author into a celebrity, a position which he reveled in. The publisher was concerned about the frequency of a particular four-letter swear word that featured prominently in the text so Mailer spitefully went back and changed the spelling of each one to “Fug”, giving the book added notoriety upon its release. Allegedly this petulant decision caused actress Tallulah Bankhead to say upon meeting Mailer, “Oh, you’re the young man who doesn’t know how to spell”. The book’s impact however went far beyond that controversy and launched Mailer’s career that saw him eventually win a Pulitzer Prize and become one of the most well-known authors in the world. The Naked And The Dead was ranked as the 51st Greatest Novel Of The Twentieth Century by The Modern Library. Late spring is traditionally one of the most popular times for getting married and that means buying wedding gifts for the newlyweds. What bride wouldn’t enjoy making toast for her new husband each morning as he goes off to work to earn a living while she’s left to clean the house, shop for food and have plenty of children to carry on his name! 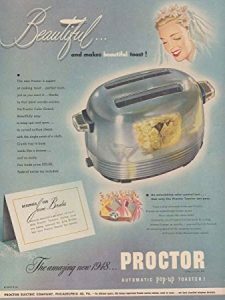 A Proctor pop-up automatic toaster costs just $22 and will provide hours of enjoyment for the new wife while ensuring her husband won’t go hungry while doing important man things like kissing up to his boss and telling dirty jokes around the water cooler. The Supreme Court rules unanimously in Shelley v. Kraemer that states can not enforce restrictive housing covenants that bar people from buying or living in homes based on their race as it violates the Equal Protection Clause of the 14th Amendment. In 1946 a black couple bought a house in a Missouri neighborhood that had a long standing private agreement between homeowners prohibiting sales to black families within the subdivision. When this covenant was broken by one resident in order to sell to the Shelleys, another family, the Kraemers – who lived ten blocks away but owned property on the street which they felt would decrease in value if the Shelleys moved in – went to court to see to it that the covenant was enforced by the state. Though the court didn’t bar the private agreements themselves, the decision made them meaningless should the seller choose to break the covenant on their own, another important step towards true integration. 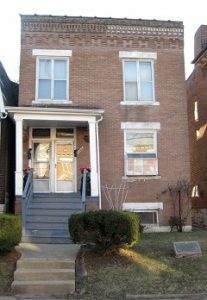 Today The Shelley House, an otherwise unassuming brick duplex at 4600 Labadie Avenue in St. Louis, is a National Historic Landmark, serving as both a sad reminder of the lengths that white America went in an attempt to cling to their unlawful privileges in society, as well as a beacon of hope that indicates eventually the law will side with the righteous and see to it that the credo all men are created equal is carried out. The post-war craze for high speed transportation has reached even the bicycle trade, as Whizzer Bike Motors are available for the low, low price of $97.55! These gas powered engines can be attached to any men’s bicycle (no, it’s not sexist for once, but rather due to design, for the bar that goes across men’s model bikes is where the gas tank is attached). The two and a half horsepower motors get 125 miles to the gallon, which is probably much farther than you’d ride a bike if you had to pedal it. Of course it makes the saying “Once you learn to ride a bike you never forget” obsolete, as you need to master the twist grip controls, in addition to learning how to keep your legs away from the chrome exhaust now sticking out the side and what exactly to do with your feet on the still attached, and presumably still usable, pedals. According to the company themselves over a hundred thousand are in use and now you too can join them and be made fun of for riding a make-believe motorcycle. It’ll only cost you about a hundred bucks and most of the skin off your calves in the process. A gallon of gas costs 16 cents if you can find a station attendant who won’t laugh while filling your bicycle.